A breakdown by Two Ten President Neal Newman reveals the great volunteering work being done industry wide. It all adds up! We held group events in eight cities during April 2018, our focus-launch month. Holding group events in 10 cities in April. While a recent report in Forbes cited that volunteerism is the fastest growing employee engagement and team building activation in the U.S., Newman notes the footwear industry is still the only industry in the U.S. that engages in community service under a collective, organized effort like Footwear Cares. It’s a terrific example of cooperation for a greater good—something our country could use a lot more of right now! “Thank you to everyone who volunteered and made a difference in their communities,” Newman says. 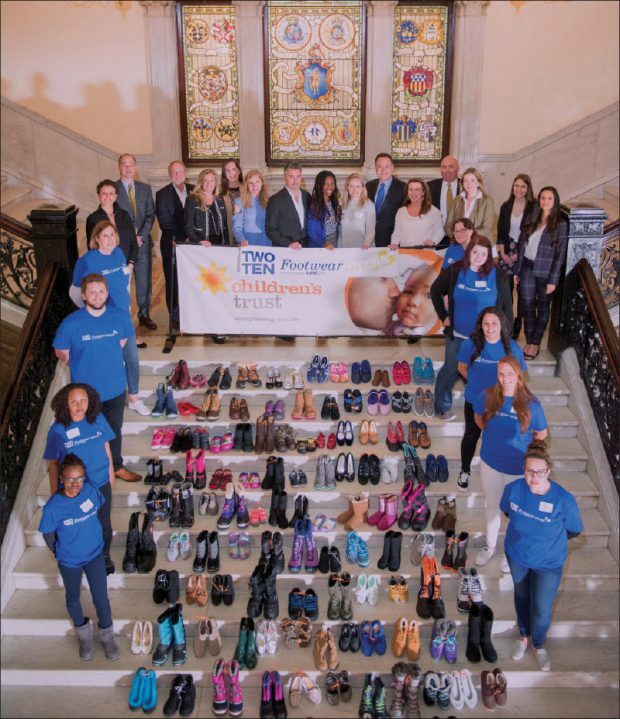 steps of the Massachusetts State House, displaying its donation of 344 pairs to The Children’s Trust in support of victims of child abuse and neglect.